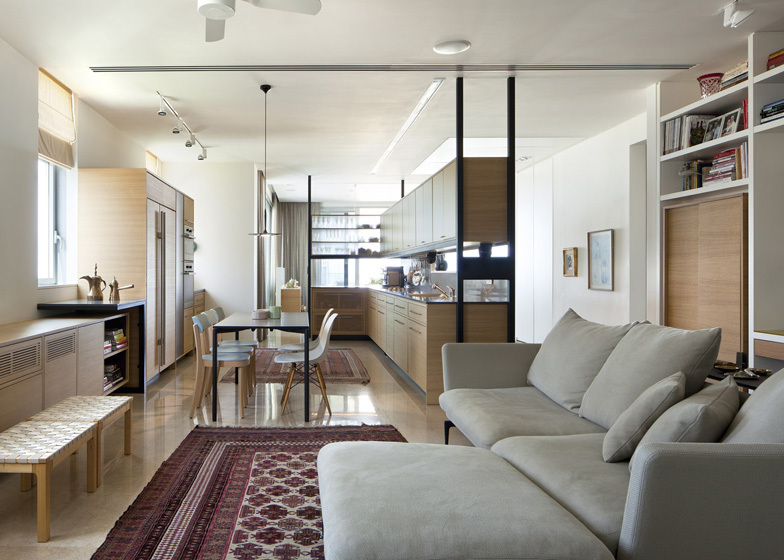 Play "spot the woman" in this photo set of an apartment that references Tel Aviv's 1950s interiors by Israeli practice Jacobs-Yaniv Architects (+ slideshow). 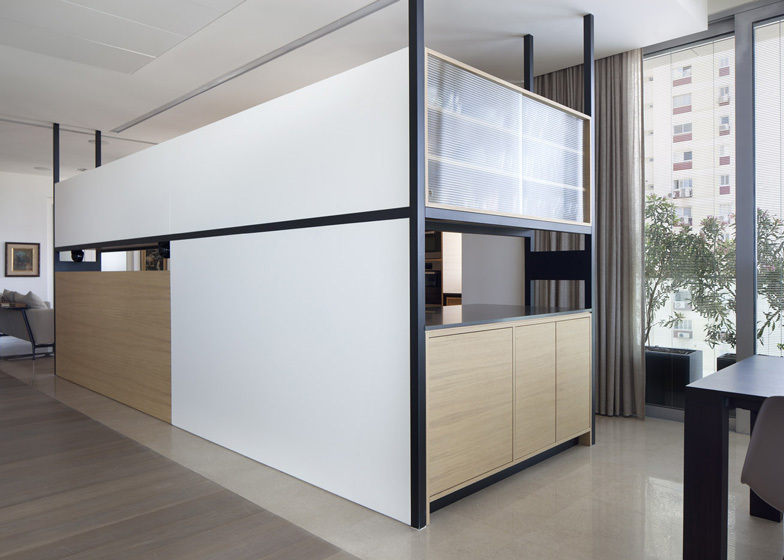 As the clients are modernist enthusiasts, Jacobs-Yaniv Architects used materials, colours and furniture from the movement's heyday to inform the design of the 190-square-metre space. 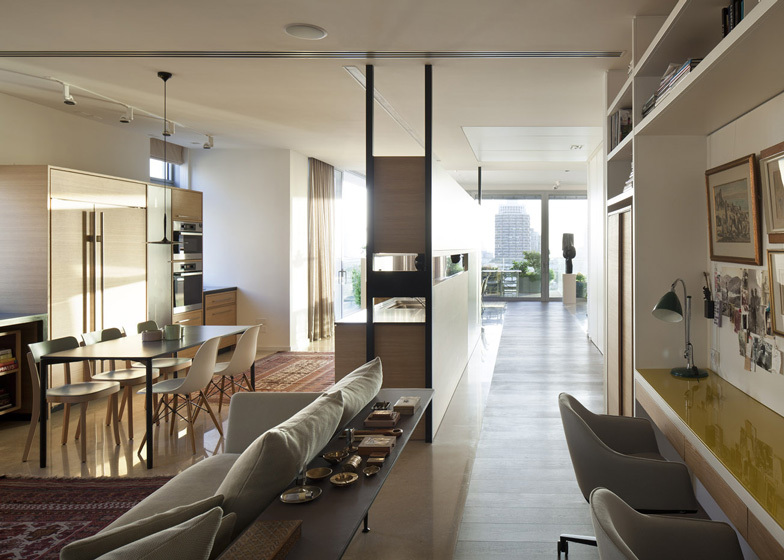 "It was a great joy to study flats of Tel Aviv's 50s, which were designed very cleverly," said the designers. Spaces are kept as open as possible in keeping with this style and to allow maximum flexibility for the family. A corridor denoted by wooden flooring runs the full length of the long plan, utilised as a study area and library. The master bedroom sits at the far end, with an adjacent dressing room and its own terrace. Another larger terrace is positioned at the other end, accessible from the dining and lounge areas used for entertaining guests. Placed in the centre of the flat, kitchen units supported on an L-shaped black steel frame have oak doors lower down and lacquered yellow cupboards on top. These finishes are also used for storage compartments elsewhere. The children's play area can be closed off with sliding doors to create a private guest room. 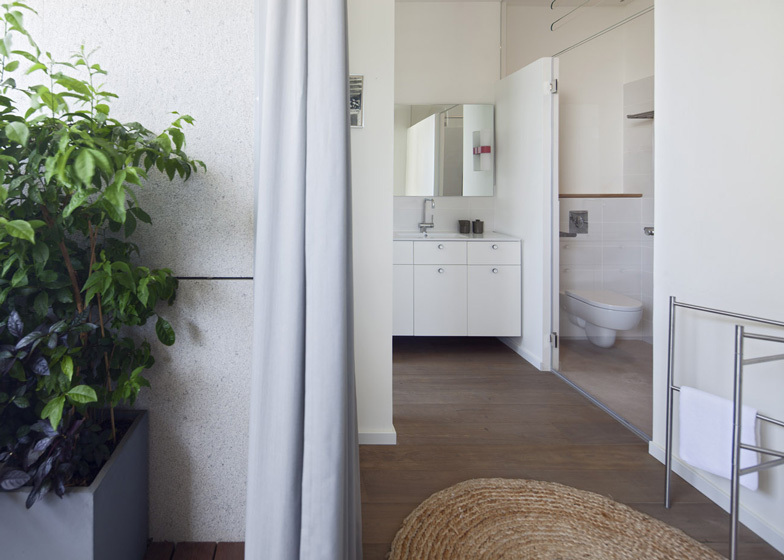 Last week we featured another Tel Aviv apartment, which has perforated metal that screens conceal rooms and storage space, and we've also posted Google's offices in the city with a meeting room full of orange trees. Informed and inspired by their love to modernist Tel Aviv of 50s and modernist design, with today's influences and technological advantages, they gained what they had hoped for. There is only one formal bedroom placed in the far end of the flat while all other functions are concentrated in the centre of the space, holding the family area, a desk for two people, the kitchen and a play area which is a flexible space used both as a play room and guest room. 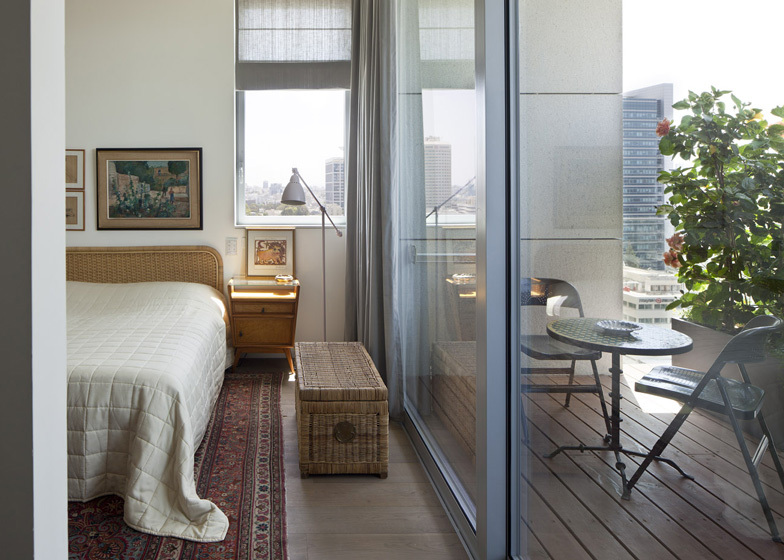 This room is placed right by the family area and can be isolated by two sliding doors - very typical of Tel Aviv's 50s. The design of the kitchen, which was placed in the centre of the flat as a piece of furniture, involved meticulous detailing. 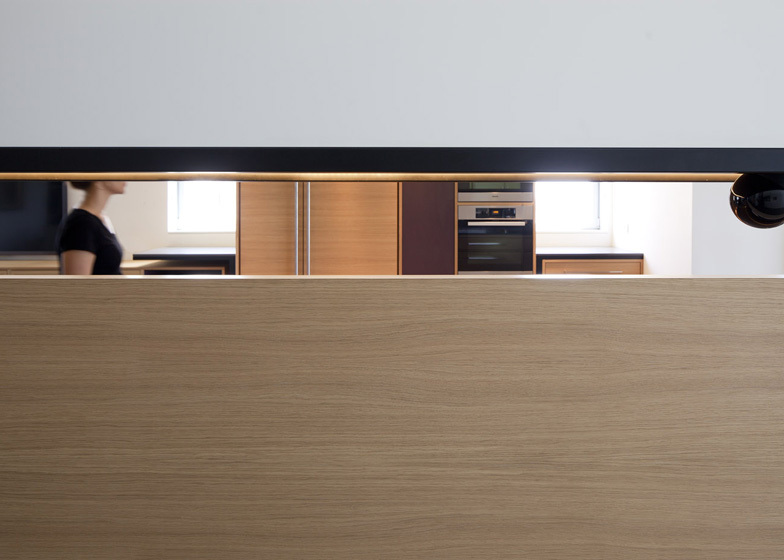 The oak and coloured Formica cupboards, lined with black internal finishing, are held within a steel structure. We strongly believe that optimum functionality and harmonious living in a home should be as flexible and fluent as possible. Therefore we plan a variety of access points from room to room and design at least one space as a 'flexible room' which can be used in different ways. It was a great joy to study flats of Tel Aviv's 50s, which were designed very cleverly providing exactly that; function, comfort and pleasure.